Christianity is living like Christ. Our pastor has a passion for Jesus and for reaching out to this community. Pastor Nicky's sermons and messages teach and inspire others to walk with God, to witness, and to live the faith. You may listen to his messages by clicking on this link which will connect you to all our Sunday Morning messages. Or click on a message below to hear the latest message. Please check our Facebook Page for the weekly live stream of our Sunday morning service. 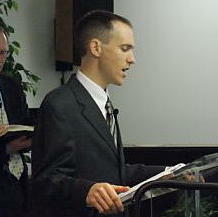 God has given Pastor Schultze a gift of teaching and placed on him a call to write and teach. Currently, he has written five books. Abiding in Christ, his first book, is a daily devotional. I AM Love is his second book and contains his life story. His latest book, The Law and You, is an exposition on the Ten Commandments. He also has a new book on the Lord's Prayer and a little booklet on what to do next after you are born again. You can purchase his books at CTO BOOKS. Pastor Schultze has a worldwide ministry called the Call to Obedience. Each month he writes a message that is put out in six different languages and sent around the world. Thousands of lives are being changed because of the gospel and discipleship message found in the CTO letters. There is also a Call to Obedience Radio Ministry that airs in Kokomo. All of these messages can also be heard online. To find out more about this ministry, to listen to a radio message, or to sign up for the Call to Obedience Newsletter, click on the link below. There is also a Spanish site for the Call to Obedience that you can find here.